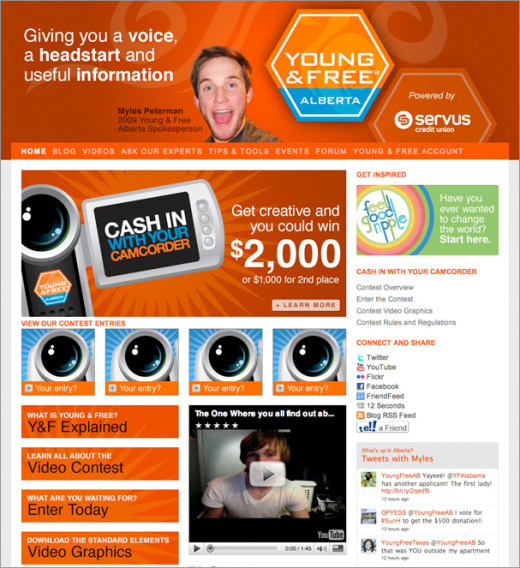 Our founding Young & Free partner, Alberta's Servus Credit Union, has just launched an exciting new promotion called Cash In With Your Camcorder. With our help, Servus is asking young adults to create a 30-second commercial that shows why the Young & Free Chequing Account rocks. The first place winner will receive $2,000 cash and the second place winner will receive $1,000! Plus, the winning commercials may be used in future advertising! The Cash In With Your Camcorder video contest provides yet another way for young people to participate in Young & Free in a fun and interactive way. It's a great complement to the Spokester search and will allow more creative young adults to show their talents. Nov 15 Listerhill Credit Union is having great success with Young & Free Alabama!